Ultramodern design elements blended with all-aluminum construction, these contemporary Aluminum Flat Benches make a visual statement. A top choice for both indoor and outdoor installations—creating casual, comfortable sitting areas that leave distinguished impressions on guests. 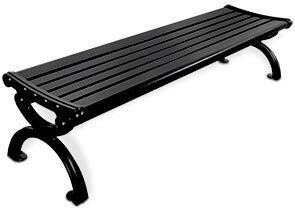 These imported backless benches provide open, two-way seating featuring a slightly contoured seat with clean, rounded edges to ensure user comfort and safety. The powder-coated aluminum construction offers rust-proof, lightweight durability that is ready for any environment. 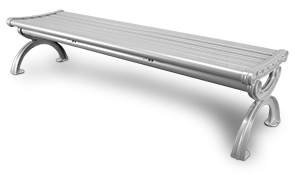 ►Need an Aluminum Park Bench Fast? ► Items ship within 48 hours on orders up to 5 units. Lead times are in business days. Orders placed after 10:00 a.m. CT or on a weekend/holiday, zero day is the next business day.